My friends at Kastle Rock Couture have organized a hunt called The Midsummer Night's Dream Hunt, which starts on June 21. I had forgotten some of the details, so I pulled out my copy of The Complete Works of William Shakespeare and reviewed the play. In this one, Oberon (king of the fairies), who is having a disagreement with Titania, sends Puck to put drops of nectar from the Love-In-Idleness flower on the eyelids of the sleeping Titania (queen of the fairies). The effect is that when Titania awakes, she falls in love with the first creature she sees.....and you know the rest. What fun! The Love-In-Idleness flower is said to be the purple pansy. 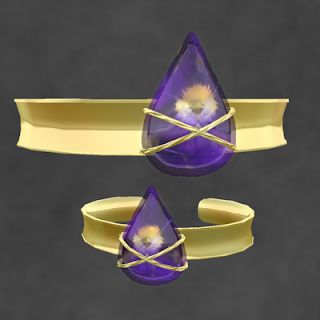 So, my hunt gift is a convenient set of gold cuffs containing a vial of the tricky nectar. I've made it in two sizes, and they are both resizable. So, you can wear them on wrist or upper arm. And, yes, I consider them unisex fellas--'cause Puck would be happy to wear one. Hair: Truth Hair--Paige in auburn. Skin: Mamboo Chic--Iseb in sweet pale.